Christopher Tocco and Darren Dunstan. Photo courtesy TheatreWorks. Theatreworks’ 2 Pianos 4 Hands bills itself as a universal exploration of excellence, mediocrity, and disappointment – some of my favorite themes in the American theatre. However, it also presents lively physical comedy with vaudevillian characters, packaged in an unorthodox narrative that jumps between the stories of two upcoming classical pianists. This format, along with the well-rehearsed piano segments and versatile talents of actors Darren Dunstan and Christopher Tocco, results in an entertaining play that solves some of the issues of the genre. Using a casting trick similar to The Complete Works of William Shakespeare (abridged), the two actors play multiple characters – parents, teachers, and audiences – in the piano careers of youth virtuosos Ted (Dunstan) and Richard (Tocco). There is some multimedia use (a shadow-puppet dad swinging a golf club, for instance), but for the most part, we know the different characters through versatile acting work on both sides. No part, not even the main characters, requires incredible depth (as can be expected from a comedy), but 2 Pianos requires a breadth that Dunstan and Tocco capture magnificently. One of the biggest issues in farce is that its larger-than-life characters can often become repetitive – for example, the sour maid in Boeing Boeing. However, the “two-actor” format means that the play can use characters only as long as they’re funny. Overbearing European piano teachers – giving their students ironically opposite advice on arpeggios – may be tiring after ten or fifteen minutes, but playwrights Ted Dykstra and Richard Greenblatt had the good sense to limit these characters to two minutes, constantly shuffling in new jokes as the old ones become tired. Though the characters are exaggerated for comedic purposes, the protagonists are named after the playwrights for a reason. 2 Pianos gives a heartbreakingly realistic rendition of the foibles of practicing an art like piano, especially for children at their most energetic and playful life stage. Anyone who played an instrument as a kid can recognize some of themselves in the Ted and Richard of the first act: the playful improvisations, the attempts to weasel out of practice for a few minutes at a time, the stifling silence of not knowing the answer to your tutor’s question. You will probably cringe at some of the scenes, not because they’re poorly written but because they’re written with such an attention to detail. The protagonists’ eventual development into dedicated musicians through Act 2 is at turns miraculous and sad. 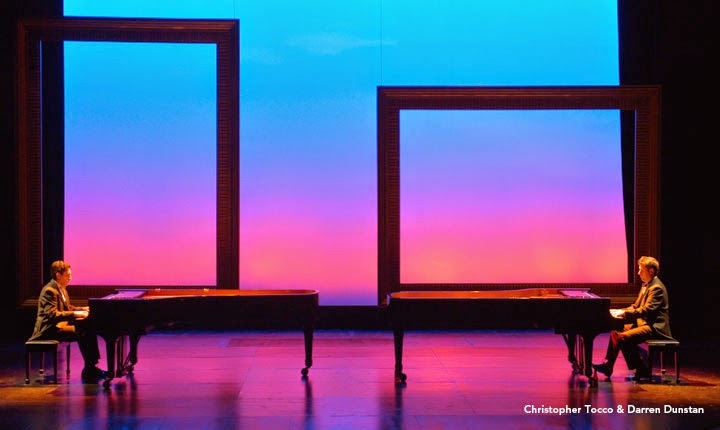 In a theatrical environment where the Noël Coward farce frequently dominates comedy, 2 Pianos 4 Hands refines the formula while introducing heavy themes and intricate structure. Experienced playgoers will love the elegance of its presentation, while its jokes and message will appeal to anyone who wanted to be great – or anyone whose parents wanted them to be great.